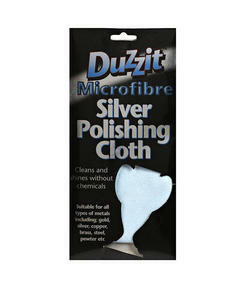 Find the easier way to spotless metals with this Duzzit Microfibre Silver Polishing Cloth. Designed to attract and lock in unwelcome dust and dirt, it will bring a sparkling smear-free shine to all metal surfaces around the home. Simply polish the surface to remove tarnish and create a long-lasting shine. Measuring at approximately 30cm x 25cm; the cloth is also machine washable - delivering immaculate and grime free metal surfaces, time after time. This Duzzit Silver Polishing Cloth cleans and shines for sparkling smear-free metal surfaces, without the use of chemicals. Originally made for silver, the cloth is perfect for all types of metals; including gold, silver, copper, brass, steel and pewter etc. Much easier than liquid polish, the cloth is made from microfibre which intelligently picks up and locks in unwanted dirt and grime. Measuring approximately 30cm x 25cm, the cloth can cover a large surface area - for maximum cleaning power in minimal time. This superb polishing cloth is also machine washable, guaranteeing spotlessly clean metals around your home, time and time again.